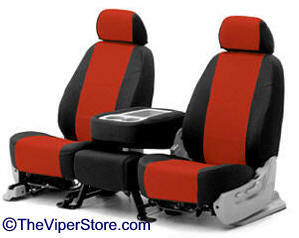 Includes 2 covers, one for each front seat. 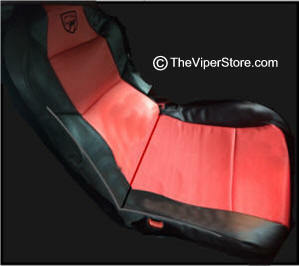 Custom seat covers fit convertible or coupe Viper SRT10's. 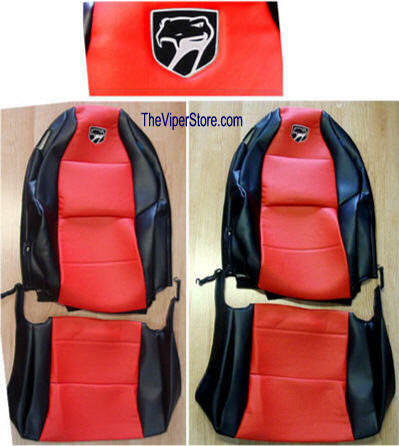 Optional embroidered Viper "Fangs" Logo. Super high quality from CoverKing. 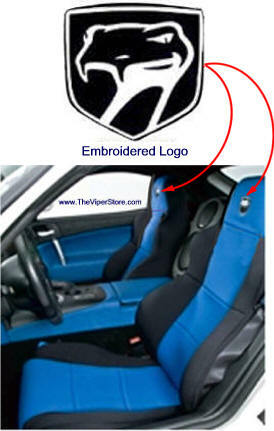 Logo Option - Includes 2, one for each front seat. NOTE: Photo above is only one example of available materials. 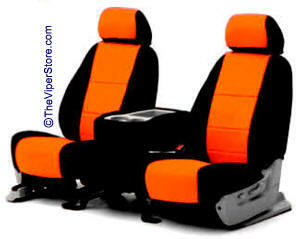 COOL & SPORTY: These smart-looking two-tone covers are a favorite with sports car owners and the merely “sporty,” alike. This unique fabric, with its large number of closely-spaced holes knit into the weave keeps everything cool, dry and comfortable, especially in warmer weather. Optional Viper "Sneaky Pete" logos. 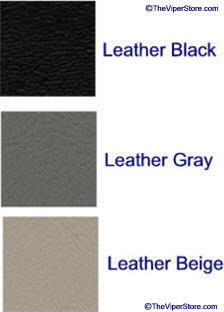 AFFORDABLE && ACTIVE: What “"leatherette"” is to leather, "“neosupreme"” is to "“neoprene. 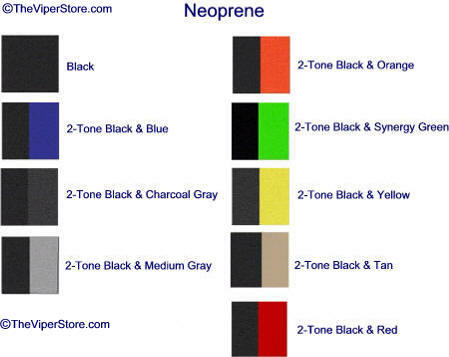 "” A lightweight, inexpensive, water-resistant alternative to neoprene, these covers are vibrant! 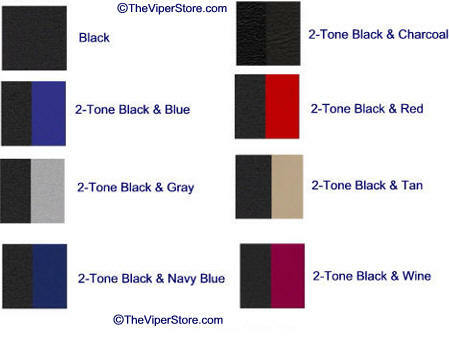 WET SUIT MATERIAL: It protects against dirt, moisture, spills, pets, kids, and comes in a wide variety of styles. 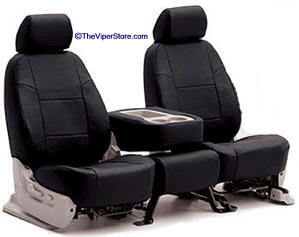 It is popular with owners of trucks, convertibles, and racers. We just read this description over and bought a set ourselves! AFFORDABLE LUXURY: Amazing! These padded, high-grade vinyl covers look and feel so much like leather, but at a fraction of the cost, that some major auto makers install them to “"class up"” their vehicles. Water-resistant and easy to clean, it is like having "leather," only without the “Oh, no, I spilled my soda on the leather" worry. 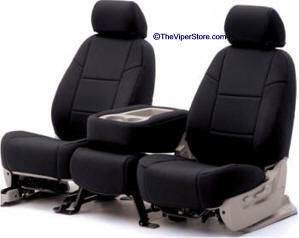 PREMIUM LUXURY: Can you say “"luxurious? 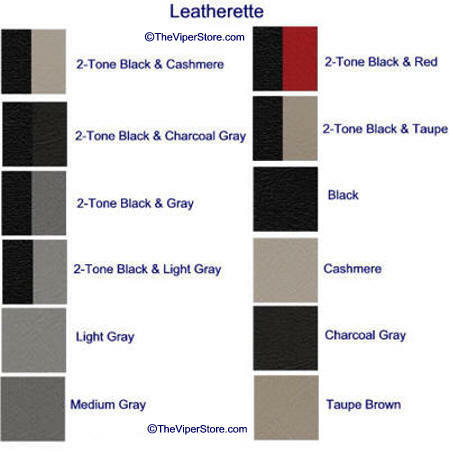 "” For the “"accept no substitutes"” crowd, this is the same durable yet comfortable genuine top-grade American cow leather found in high-end luxury cars, and tanned specifically for automotive interior use.